McCall's Needlework provided the free instructions and patterns for Lois Caron's exclusive design "Kazak Box and Glasses Case" featured in their June 1977 issue. 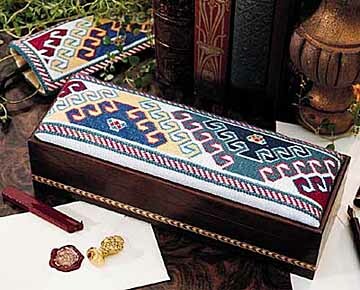 "A cross-stitch geometric pattern in a myriad of colors from The CARON Collection decorates the top of this wooden box, the perfect accessory for a man's desktop. Alongside the old books, the glasses case is stitched in the same pattern but in needlepoint. Create the duo as a stunning desk set or make one for a unique gift. Either will be cherished as a striking statement of style and elegance." For your convenience the Kazak Box chart has been divided into sections. Follow the easy links on the "Kazak Box Chart" page, print out each section then tile the pieces together. Print out the instructions and follow the legend provided for thread colors.